Moving on then- the thought process behind the makeover. And what’s even more interesting perhaps is that I can almost post-viz take some of the thoughts that Andy had regarding this week’s visualizations and provide my context. Based on the original visualization I had an inkling that there wasn’t going to be a ton of data funneling in. 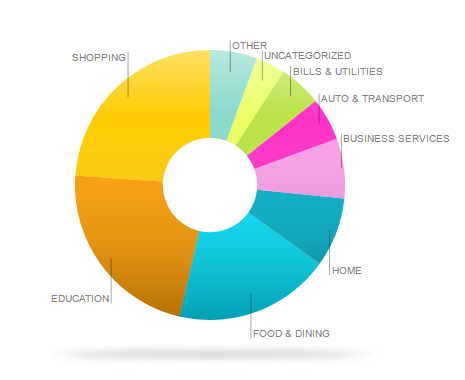 Being an individual who tracks all expenses and has seen them visually represented, I felt like food should represent a larger proportion of expenses. For reference, here’s a wonderful donut chart that Mint.com provided me on my top 3 most used credit cards. I funnel everything I can through credit cards, and food in general takes up a huge portion of spend. Both of these visualizations leave something to be desired. I like Andy’s original AMEX one better than the donut I got, but they are both very distilled. Andy spent a lot on transportation and travel, and apparently I spent a lot on shopping and education. Getting REALLY specific about the data – there were 110 records (FYI my donut is 477, 209 is food/dining). Plotting the data quickly over time, there were large gaps of time with no purchases. 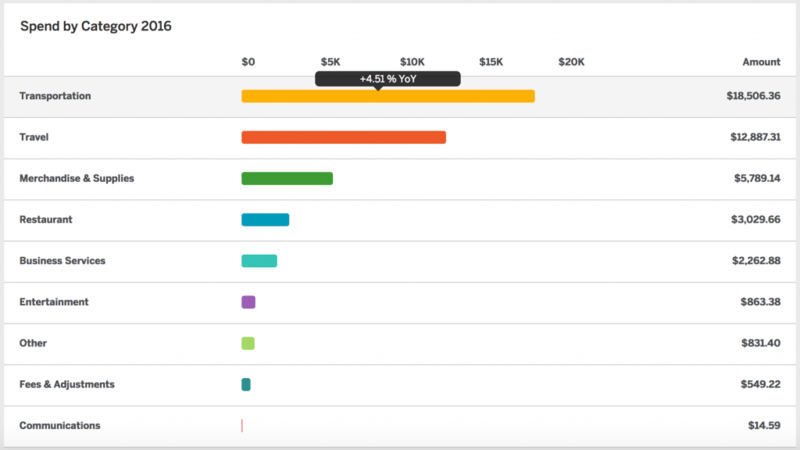 Armed with this, I decided to take an approach of piggybacking off the predefined categories to see if throughout time Andy typically has one category that gets a lot of spend, or to see if the spend trends are lumped together. So… I kind of got really interested in utilization frequency and wanted to take it further. So the next step was to make a barcode chart. 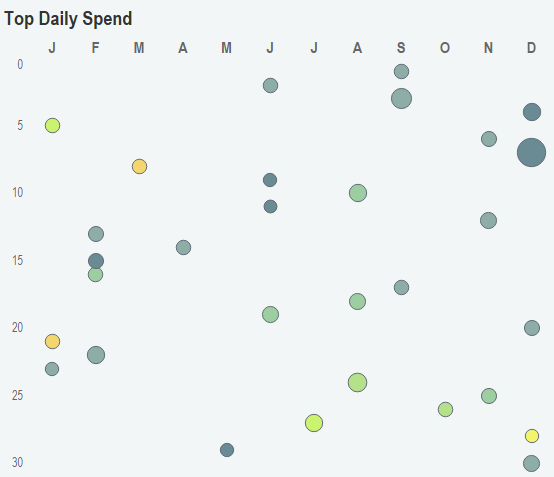 Very similar in concept to what the “top daily spend” is showing, but not limiting the data to only the top daily in this case. Insights gained here – I get this feeling that Andy may only (or mostly) use his AMEX for meals where he’s out traveling. Hovering over the points would add more insight to the transaction values. More than that, we get a feel for what this card is generally swiped for: the 3 categories at the bottom (and FYI I ranked these by sum dollars spent). Finally – bundling it together in a palatable format – what were the headline transactions for the year? I wanted to do monthly and have categories, but there wasn’t enough data. So I opted to go transaction level and keep it top 5 each quarter. I think there’s novelty here in terms of presentation, but also value in quick rough comparisons of values over each quarter. So the thought process in general behind the path I took this: I wanted to explore how often Andy spends money in certain categories. I was intrigued by frequency of usage to see if it could eventually point back to provide the data creator (the guy who bought stuff) some additional aha! moments. To be more honest – I actually think this is something that I would want for myself. 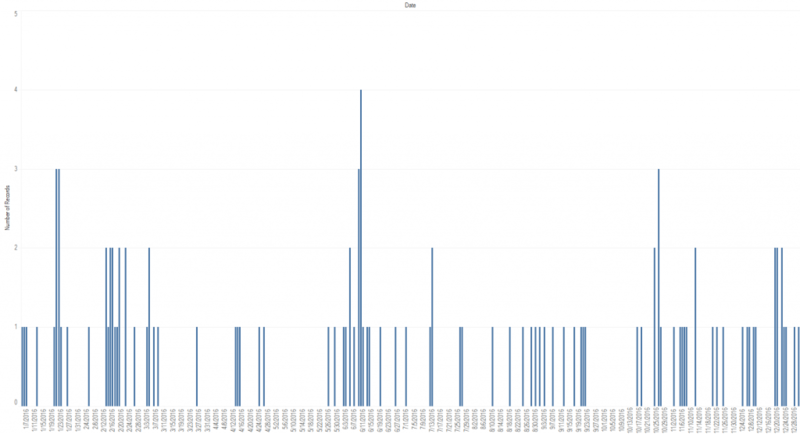 I in particular would love to plot my Amazon.com transactions and see how that changes throughout the year. Both in barcode for frequency (imagining Black Friday is heavy) and then to see if I’m utilizing their services any differently. (I have this feeling that grocery type purchases are on the climb). Oh – and in terms of asking about colors and fonts: I did go Andy’s blog for inspiration. I wanted to do a red/blue motif based on the blog, but needed more colors. So I think I googled “blue color palette” and ended up with this cute starting palette that evolved into having pops of orange and yellow. Font: I left this to something minimal that I thought Andy would be okay with (Arial Narrow) that would also bode well across all platforms. Really like this review Ann! And you are correct in your assumptions about my usage. I primarily use it to pay for travel or while traveling. Day to day, I don’t use it. Hence why food is so low. Great insight and beautiful work! Thanks Andy – I’m unbelievably appreciative of the time you have spent in offering your expertise to the growth of the community (and me personally). Your engagement has been critical to my own growth and fueled my passion to continuously contribute.